Lt Sheikh Jamal Dhanmondi Club Ltd opener Imtiaz Hossain poses for a photograph after winning the player of the match award during their Dhaka Premier Division Cricket League match at BKSP Ground-3 in Savar on Friday. 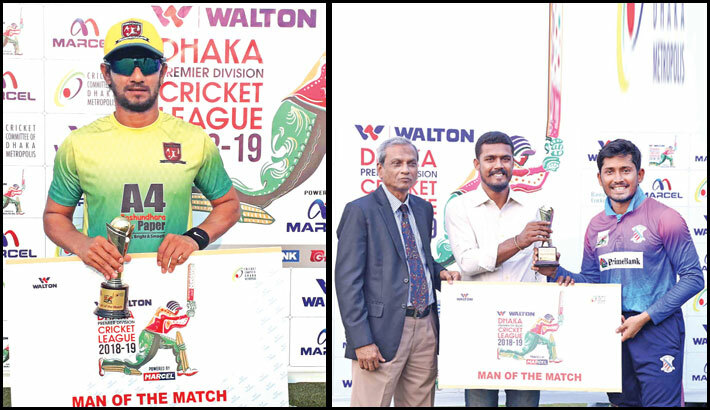 (Right) Prime Bank Cricket Club skipper Anamul Haque Bijoy, right, holds the player of the match award after scoring a century against Abahani Limited during their Dhaka Premier Division Cricket League match on Friday. Lt Sheikh Jamal Dhanmondi Club Ltd edged past Mohammedan Sporting Club Ltd by 2 wickets in their Dhaka Premier Division Cricket League (DPL) encounter at Bangladesh Krira Shikkha Protisthan Ground 3 in Savar on Friday. Mohammedan opted to bat first after winning the toss and put on 240 runs on the board losing all their wickets in 49.1 overs. In their reply, Sheikh Jamal got over the line with a six of Enamul Hoque as they scored 242 runs losing 8 wickets in 50 overs. With 11 runs required in the final over and 3 wickets in hand, Sheikh Jamal were poised to get over the target without much fuss. But Mohammedan’s ace bowler Alauddin Babu who bowled the final over gave 3 runs in first 2 deliveries and picked up Sheikh Jamal batter Taijul Islam in the third one. The complexion of the match changed as Mohammedan regained control bowling tightly and giving away just 3 runs in the next 2 balls. It was all down to the last delivery as Sheikh Jamal’s Enamul who was in strike needed to score 4 runs in last ball. But Enamul had his own plans as he heaved Babu for a massive six bringing Sheikh Jamal home to a morale-boosting victory. In their chase, Sheikh Jamal started off well with their opener Imtiaz Hossain tonking 74 runs to set the momentum. Tanbir Hyder (39) and skipper Nurul Hasan (32) chipped in with valuable contributions down the middle. But it was due to the timely cameo of Enamul Haque as he bashed 28 runs off 17 deliveries to anchor his side to the shores of victory. Mohammedan bowlers Sohag Gazi took 3 wickets for 43 runs while Chaturanga de Silva managed 2 wickets for 36 runs. Earlier, Mohammedan put on 240 runs losing all their wickets on the back of a pure team effort with Abdul Mazid top-scoring with 52 runs while Silva and Mohammad Ashraful scored 49 and 44 runs respectively. Sheikh Jamal’s Salauddin Shakil continued his golden run with the ball taking 3 wickets conceding just 41 runs. In the day’s other match, Legends of Rupganj beat Gazi Group Cricketers by 8 wickets thanks to the massive 226-run third-wicket stand between Mehedi Maruf and Jaker Ali. Both of them hit centuries. Rupganj won the toss and decided to bowl first. Gazi posted 259 runs for 9 wickets in 50 overs at Sher-e-Bangla National Cricket Stadium. Parvez Rasool (86), Imrul Kayes (48) and Rony Talukdar (29) were the phenomenal for Gazi. For Rupganj, Muktar Ali bagged 2 wickets while Mohammad Shahid, Rishi Dhawan, Naeem Islam Minhazur Rahman took one each. While replying, Rupganj lost 2 wickets for 27 runs. However, in the third wicket stand, Maruf and Jaker posted 226 runs and won the game for their team in 45.3 overs. Meanwhile, Prime Bank Cricket Club defeated Dhaka Abahani Limited by 17 runs in their DPL encounter at Khan Shaheb Osman Ali Stadium in Fatullah. Prime Bank put 302 runs losing 5 wickets on the board batting first and later bowled out Abahani for 285 runs in 48.5 overs. Anamul Hoque scored a sensational century of 102 runs of 128 balls to claim the man of the match title. Veteran Indian batsman Wasim Jaffer (94) and Nazmul Hossain Shanto (73) looked on course to get Abahani over the line but everything fell apart after their departure as Prime bowlers Al Amin and Nahidul Islam took control of the match taking 3 wickets each for 45 and 56 runs respectively.